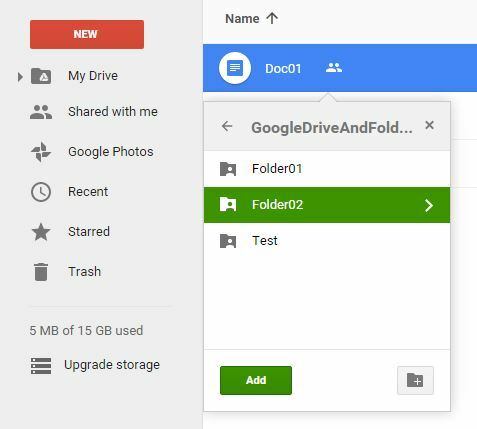 The goal of Google Drive Files and Folders is to help you become familiar with creating folders and files on Google Drive. The goal of this assignment is to help students become more familiar with Google Drive and similar tools. Our data belongs in the cloud. There is no other place to put it where we can reach it easily from all our devices. If our data is going to be in the cloud, then we have to be on speaking terms with the tools available in the cloud. Create a folder inside our shared folder. Call it GoogleDriveAndFolders. And be sure to put it inside the Google Drive folder you have already shared with me. Create a Google Document, Spreadsheet(Sheet01) and Google Slide(Deck01) inside that folder. Name the Document Doc01, the SpreadSheet Sheet01 and the Google Slide Deck01. Create two folders called Folder01 and Folder02. The document and spreadsheet should be in the following folders: GoogleDriveAndFolders and Folder01. A document called Folder01Overview should be in Folder01. A document called Folder02Overview should be in Folder02. Each file in your folder should have one line of text in it: "This is Doc01", "This is Deck01", etc. It is important to understand there should be only one instance of Doc01, Sheet01, and Deck01. To place a document in one folder, simply navigate to that folder and create the document inside it. To move it from one folder to another, put a check mark in front of the file or folder, then click the Move To icon, which is shaped like a folder, and which is located near the top of Google Drive window. But we don't want to move a file, we want to link to it, we want it to appear to be in two places at once. Do this with Shift-Z. Figure01: If want a file to appear in multiple places, you should select the file and then type Shift+Z and click the add button. This will allow you to link to one file from multiple places. Figure02: To see where a file is located, choose the file, click the Information Button | Details | Location. I don't think this works anymore. But once upon a time, if you held down the Ctrl key, and clicked with the left mouse button, then you could place a document or folder in more than one location. When you are done with the assignment, simply submit the URL of your Google Drive or submit almost anything that lets me know you have completed your work. I can then find your files and folders and check that you have completed the assignment correctly. 1) To create three different types of files: Google docs, sheets and slides 2) Create folders and put documents in them 3) Have at least some documents appear in multiple folders. 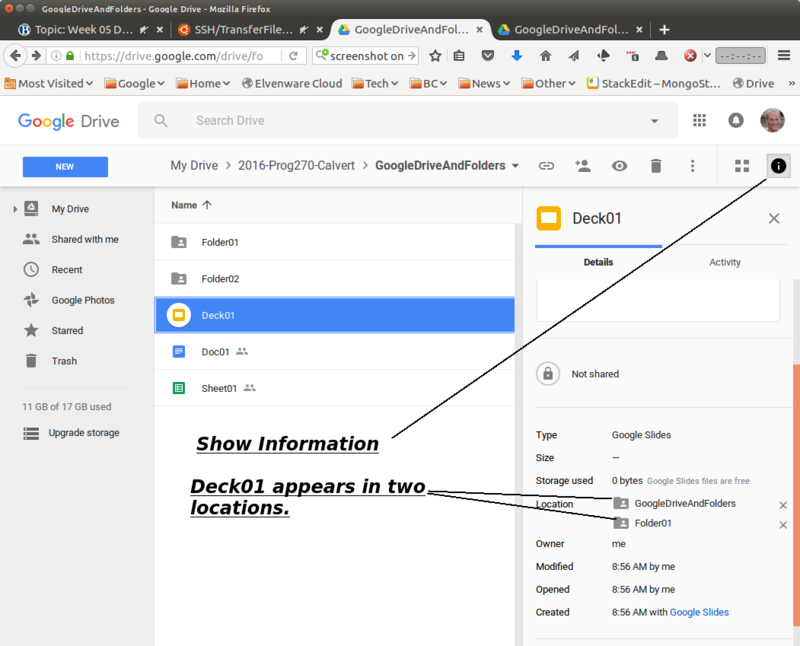 Suppose you have Doc01 in GoogleDriveAndFolders and in linked Folder01. You decide you only want it in GoogleDriveAndFolders. Select the file in Google Drive (Click once on it). Then click the i for information icon so you can see the info. Turn to the details page if you are not there already. Now you can click the X icon to remove it from Folder1 but keep it in GoogleDriveAndFolders.